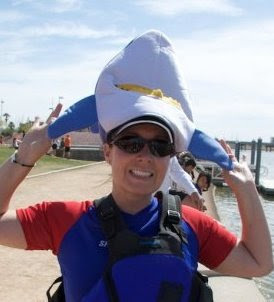 Space Dragons Dragon Boat Racing Team: Paddler Spotlight - Kat! Stick with it, even when you're sore as hell, and soon you'll have guns like Rod!! More potlucks... this team can cook! Again, the potlucks, the laughter & friendship, the hard work and pride,the truly diverse group of people that I consider family! Everyone always seems to identify the teammates that make them laugh with their antics, but I wanted to give a shout-out to Coach Em. I have truly enjoyed Sundays on the gender boats. Your coaching is inspirational and patient, and you not only make me want to be a better paddler, but also a better teacher... thank you! Who got you into Space Dragons/Dragon boating ? Scott got me in, but have known Denise for 20 some odd years... I just didn't know she was paddling, so it was a fun discovery to reconnect with a long-time friend.